Plants have developed a number of strategies to capture the maximum amount of sunlight through their leaves. As we know from looking at plants on a windowsill, they grow toward the sunlight to be able to generate energy by photosynthesis. Now an international team of scientists has provided definitive insights into the driving force behind this movement—the plant hormone auxin. The growth of plants toward light is particularly important at the beginning of their lifecycle. Many seeds germinate in the soil and get their nutrition in the dark from their limited reserves of starch and lipids. Reaching for the surface, the seedlings rapidly grow upwards against the gravitational pull, which provides an initial clue for orientation. With the help of highly sensitive light-sensing proteins, they find the shortest route to the sunlight – and are even able to bend in the direction of the light source. "Even mature plants bend toward the strongest light. They do this by elongating the cells of the stem on the side that is farthest from the light. 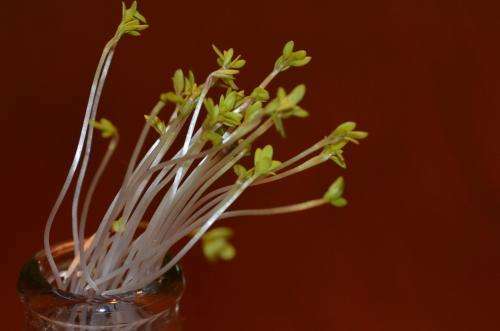 This type of light-oriented growth is called phototropism," explains Prof. Claus Schwechheimer from the Chair of Plant Systems Biology at the Technische Universität München (TUM). The substance responsible for cell elongation is auxin. This phytohormone is formed in cells at the tip of the shoot and is then passed from cell to cell. As such, the hormone is shuttled through many cells of the plant before it reaches its final destination. "Export and import proteins push the auxin out of one cell into the intercellular space and then into the next cell and so on until the auxin eventually reaches its target site," outlines Schwechheimer. The most important proteins in this process are the export proteins known as "PINs", which regulate the direction of the auxin flow. As Schwechheimer's team was able to demonstrate, these PINs do not function on their own: "They require the signal of the D6PK protein kinase," Schwechheimer continues. "The kinase enzyme modifies the PINs through the transfer of phosphate groups – thus activating them as auxin transporters." What is the role of auxin? The movements of plants were first described comprehensively by Charles Darwin in 1880 in his seminal work "The power of movement in plants". The theory that the plant hormone auxin could play a role in plants bending toward a light source was first proposed in 1937 by the Dutch researcher Frits Went in the Cholodny-Went model. Even though many subsequent observations have supported this model, up to now there has been no definite proof that auxin is in fact involved in this process. Prof. Christian Fankhauser from UNIL (Université de Lausanne) in Switzerland explains why: "Up to now, all plants with a known defect in auxin transport showed a normal phototropism. How then could auxin transport be essential for this process?" The TUM team, in cooperation with their colleagues at UNIL, have found the answer to this question. The Swiss researchers were able to inactivate several PIN transporters in a plant simultaneously. And for their part, the TUM scientists managed to demonstrate the function of the D6PK protein kinase. It was found that when several of the PIN and kinase components were missing, plant growth was completely unresponsive to the light signals that trigger phototropism. The auxin transport mechanism in these mutant plants was severely impaired: The plants grew upwards, away from the gravitational pull, irrespective of the light source. This helped the scientists prove for the first time that the hormone auxin definitely is the substance that drives phototropism.